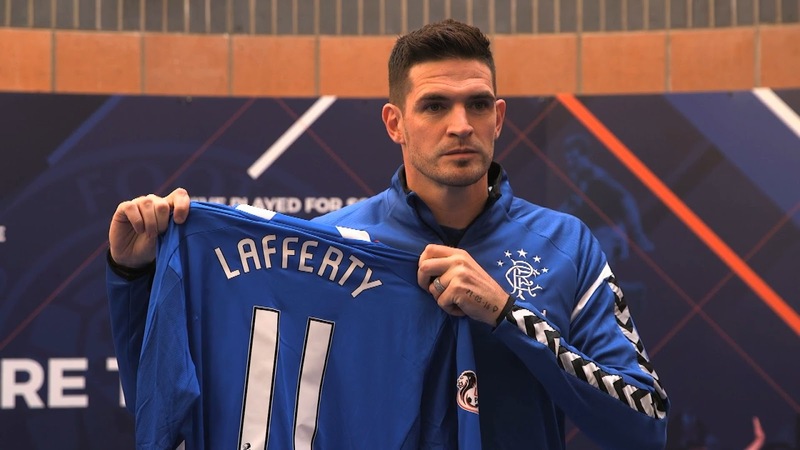 Returning striker Kyle Lafferty has made a bold yet understandable claim that he can help Rangers win the league. The three-time SPL winner with Rangers has returned home and put pen to paper on a two year deal, but the 30-year old forward, in a message to the fans, has admitted leaving Rangers broke his heart, but the returning player knows how to win and ‘will bring 55 home’. Speaking to Rangers TV, the ex-Hearts talisman again admitted he’d been badly advised in the past, didn’t want to leave, but that Rangers fans would have a different player. Clearly speaking from the heart and overjoyed to be back with his boyhood club, Lafferty may have got a little ahead himself, but given the stunning start Steven Gerrard has made to life at Ibrox, it’s hard not to get a little swept away with the positive feeling in Govan. In truth though, Lafferty does know how to win the league and frankly is a better player now than the already excellent one who left. Whether Rangers will win the league this season (or next) remains to be seen but as Kyle himself said about the performance v Maribor, that was the ‘real Rangers’ and there is just a sense of our team, management and club now feeling like its old self. Whether that leads to 55 soon is another matter, but we hope. Let`s Go For It !! bring home the brit-vic! they might even sponsor us, orange BRIT-VIC #55 T-SHIRTS WOULD BE BRILLIANT. I hope he does, just that. ye know things are going well when u hear sturgeon on the telly saying G.E.R.S. figures are improving. ...Prove them all wrong and shove their 'Rat' Comments back down their throats! He’s still a rat Stevo. I can’t believe how people on this site forget how big a fan he was when he walked out. BTW he wasn’t good enough for us 6-7 years ago and STILL isn’t good enough now. in the grand scheme of things.NOTHING. I believe he's a huge plus for our side and bet you'll be cheering his first goal too. Laff is back and we are stronger for it! Big Jim, He is not a Rat! ...He has Admitted Leaving was a mistake and was given bad advice! You can say hes a Rat all you want but what he also is, is a Goalscorer and he regularly scores against them! 25 + with players like Arfield and Coulibaly around Him. He left. He could have stayed and he left. I don't blame Whittaker, it was just a job, he wasn't a Rangers man. Neither was Goian or Bocanegra. They just had integrity. But Shagger, Naismith and Lafferty were fans in jerseys. Do you honestly think Halliday would have walked? Yes, Lafferty is a goalscorer. Not denying that. How good, how consistent time will tell. He has scored against Celtic and Morelos hasn't. Agreed. He may score even more with better players round him, agreed. He didn't give a press conference claiming we were dead. Agreed. But he left when he could have publicly proclaimed loyalty at a time when we desperately needed something, anything to cling to. He could have told McCoist he wasn't going to the 4th division, wouldn't have blamed him. But at our lowest, in the darkest of days when it seemed like Super Ally, Big Jig and Wallace stood alone, supported by the captains of Romania and the USA while Rangers fans ran, another supporter standing by us would have been helpful. I will never forget Waldo, Ally or Jig. They stood. He is now a Rangers player, and so entitled to my support. Which he will get. Until the day he leaves, when he will return to the status you claim he doesn't deserve, which I will no longer use as he is now one of us. (to some fans) the lower divisions of Scottish Football is Hallidays "Level"
Exactly! Hes back in the blue Jersey and if hescores against them/We Beat Them then we arent gonna be talking about him being a rat are we? Glad he is back. Older,wiser, a family man now, and much more focused. 55 baybee! Every one of you are a disgrace. Only rat back at rangers after stating that rangers were dead. But let's welsome them back so we might stop celtic. One one moral fibre in anyone anymore. Lafferty is a clown who only plays well in one in every 3/4 games. But because he scored again celtic all is forgiven. Terrible keeper isn't he? Fn hopeless! Lol! I agree with Ibrox Noise. I am delighted to have Kyle back, he will be a valuable player to us this season, however, I wish he would keep the "55" comments to himself and do the talking on the pitch as that is the only way to bring it home! We are doing well just now, but it is a long season and already we have injuries, so time will tell, but welcome big Kyle, good piece of business. If he wants to make it up to us, banging a few in against Celtic in the forthcoming game, will go a long way.